It's almost Christmas and what better way to celebrate the Holiday season than with the Simpsons in this extremely entertaining and "joyful" DVD. 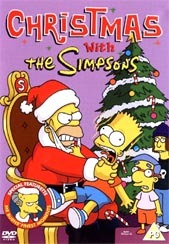 I've probably seen just about every Simpsons episode in existence and this DVD features five of the best and most entertaining Christmas type episodes of the series. The Simpsons is about your average nuclear American family that consists of the dumb but loveable father Homer, the moralistic mother Marge, the mischievous Bart, the wickedly intelligent Lisa and the baby of the family, Maggie. The first episode of this collection is entitled "The Simpsons Roasting on an Open Fire" that tells the tale of how the Simpsons acquired their pet dog, Santa's Little Helper. The second episode is entitled "Mr. Plow" and features some of the funniest moments in Simpsons history as Homer buys a plough to help the town of Springfield in winter. The third episode, "Miracle on Evergreen Terrace" is a comedic parody of It's a Wonderful Life and when Bart accidentally burns the family Christmas tree down with all the presents, Bart cries wolf and blames a cat burglar. The "Grift of Magi" is the fourth episode and features our favourite child star of all time, Gary Coleman who works for an insidious toy company. The last episode is entitled "She of Little Faith" and revolves around Lisa as she tackles her new faith as a Buddhist. The video quality of the DVD varies greatly during the disc but that is because of the original production values of the series. The first episode is actually the first ever screened episode of the Simpsons that features some rough animation when compared to the more modern episodes. The audio quality of the disc features Dolby Digital that unfortunately makes a limited appearance on the DVD but the sound is still clear and audible. The disc also features a montage of Montgomery Burns that highlight his best moments in the series and is actually quite funny. Apart from this "bonus" feature, there are no other special features on this disc whatsover. This DVD was great and it featured some of the funniest Simpsons moments in history that I would highly recommend to all DVD owners in the upcoming holiday season.